It all depends on how you look at it. It can be a child’s toy. Or juggling props. Or fitness equipment. Consequently, it won’t surprise you to learn that, on bidorbuy, diabolos are most likely to be found in the sports category. Why should I care about diabolos? Diabolo is an advanced form of Chinese yo-yo. It consists of two cup-like objects stuck together at the base. This twin-cup object – that is, the diabolo – is usually made out of rubber or plastic. Place it on a string connected to two sticks held in each hand and spin it this way and that, toss, twist, loop, hop, flip, throw, catch, twirl it and whirl it… Everything is allowed, as long as the diabolo remains balanced on the string. The speed at which it travels along the string is the key to diabolo’s stability and the player’s ability to perform various moves and tricks. Well, like many other things in life – because it’s there. Also because it’s a wonderful, challenging yet fun skill activity that makes one get off the couch. Small as diabolos are, manipulating them involves just about every muscle in the body. Playing with diabolo, say those in the know, improves hand-eye coordination and spatial awareness, as well as kinetic manipulation and control. Best of all, diabolo is for everyone aged about eight and up! That means it’s for you too. You may start by getting one for your child or grandchild, but don’t be surprised if you end up owning – and playing with – a diabolo too. It just means that you’ve become a diabolist! Diabolos are sold separately or as a kit, with two sticks and string. Some bidorbuy sellers bundle it up with a demonstration DVD. 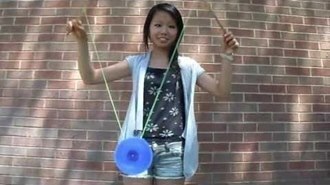 In any case, there are lots of diabolo video tutorials on the internet, though you may have to do some searching in order to discover the good ones.